Pendolino is a refined upmarket Italian situated in the heart of Sydney’s Central Business District. It’s an elegant looking restaurant – very dark, very intimate – the perfect type of restaurant for date night. Be that as it may, it has a welcoming attitude towards children as there were a few dining at the restaurant during our visit. This was nice to see as it’s so rare for such a swish looking venue to be so relaxed about child diners. Pendolino holds a ‘One-Hat’ (out of a maximum three) from the influential Sydney Morning Herald Good Food Guide’s restaurant rating system. The menu makes for a wonderful read, the type that could easily tempt you to over order. There are a range of starters, pastas and risotto that come in both starter and main sizes, mains, and of course dessert. All the pastas are hand-made daily on the premises. ($24.90, about £16) which was a knockout. 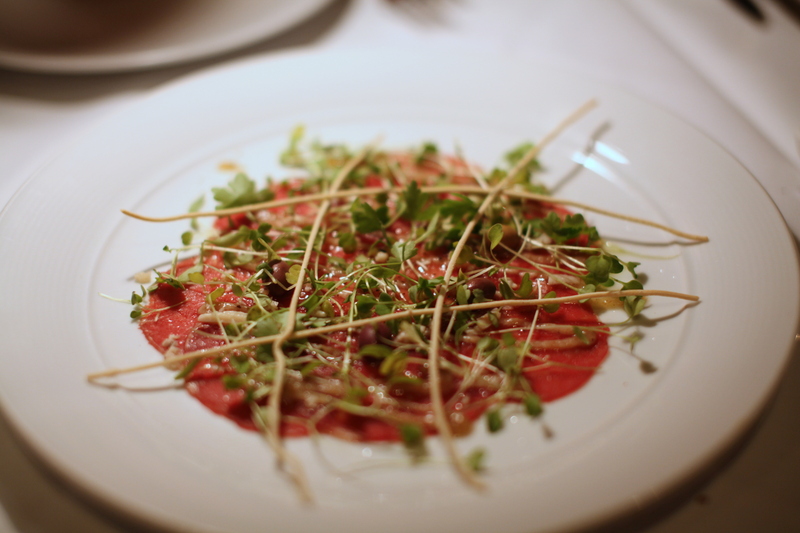 The way in which the paper-thin carpaccio melted on the tongue was sheer magic, and the aromatic hints of the truffle were a pure delight. This was a glorious dish that one could easily eat over and over again. 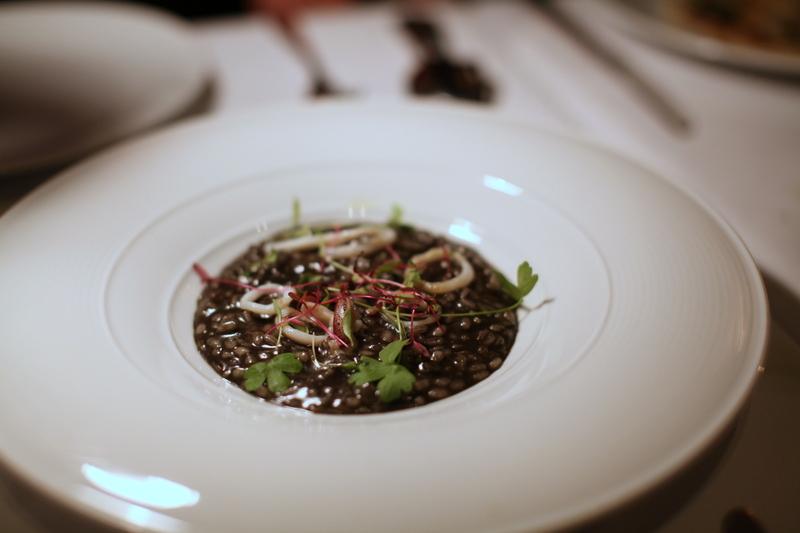 We opted for a starter of Vialone Nano black squid ink risotto with grilled baby squid, micro chard and fermented anchovy sauce ($27.90, about £18) which was ravaged by some very heavy-handed seasoning. But underneath all the saltiness, there was clear evidence that the risotto was expertly cooked – the stock had been beautifully made, the quality risotto rice had been nurtured to an al dente quality, etc. Shame then that the saltiness of the risotto rendered it rather unpalatable. The portion was also quite small for a starter and felt like poor value relative to the price. 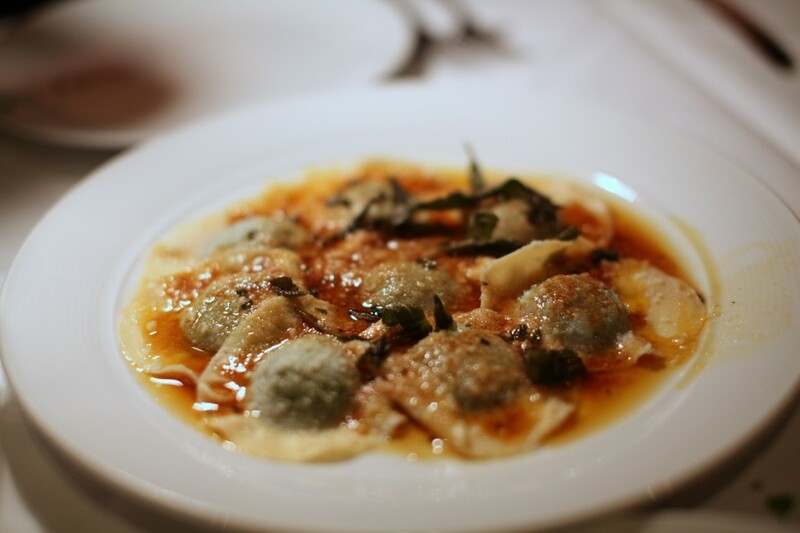 Traditional hand made ravioli with spinach, parmigiano reggiano, gruyere, buffalo mozzarella ($39.90 for a main, about £25.70) showed expert skill in its execution. The ravioli had been rolled to a perfect thinness, and the combination of the cheeses and spinach had been well judged to make up a fantastic filling. Finishing of the dish was some delicious burnt butter and sage. This could have been almost a perfect dish other than for the fact that it was also somewhat salty. 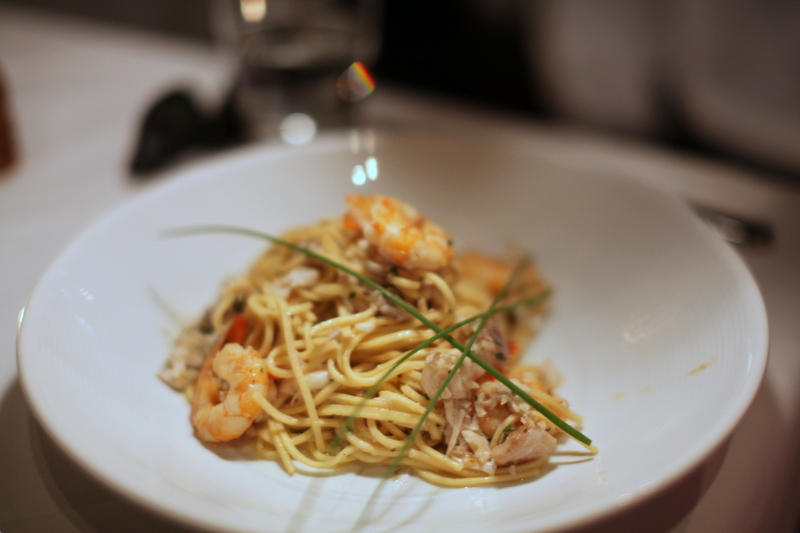 Freshly made chitarra spaghetti with barramundi, wild prawns, chilli, capers, garlic and pinot grigio ($42.90 for a main size portion, about £27.60) was lovely and satisfying. The spaghetti was really well done and springy, and the flavours of the seafood, chilli, capers and garlic all worked wonderfully well together. A classy nougat, ligurian honey and almond milk semifreddo with candied almond and crostoli ($17.50, about £11.30) was thrillingly good. The creaminess of the semifreddo with the gooeyness of the nougat merged wonderfully with the gentle sweetness of the honey and the crunchiness of the almonds. 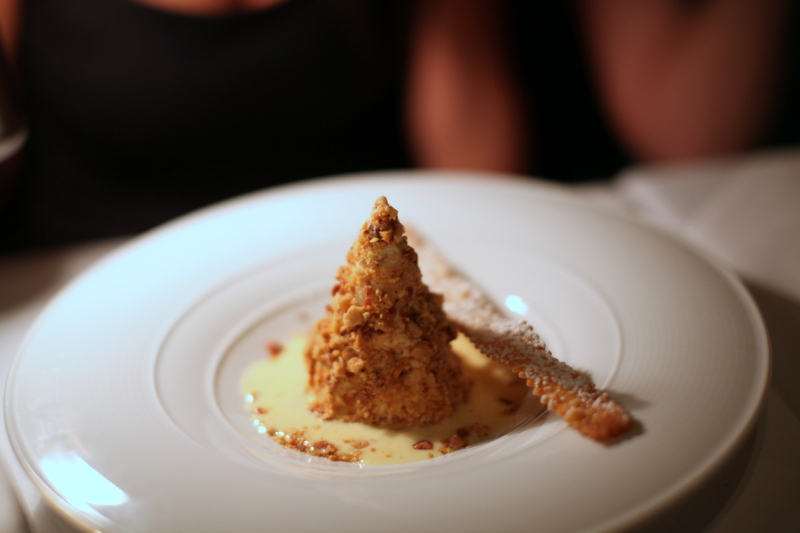 This dessert showed refinement and elegance and was outstanding. Vanilla bean and goats curd bavarese with a textured strawberry salad and wild strawberry consomme ($17.50, about £11.30) was also divine. 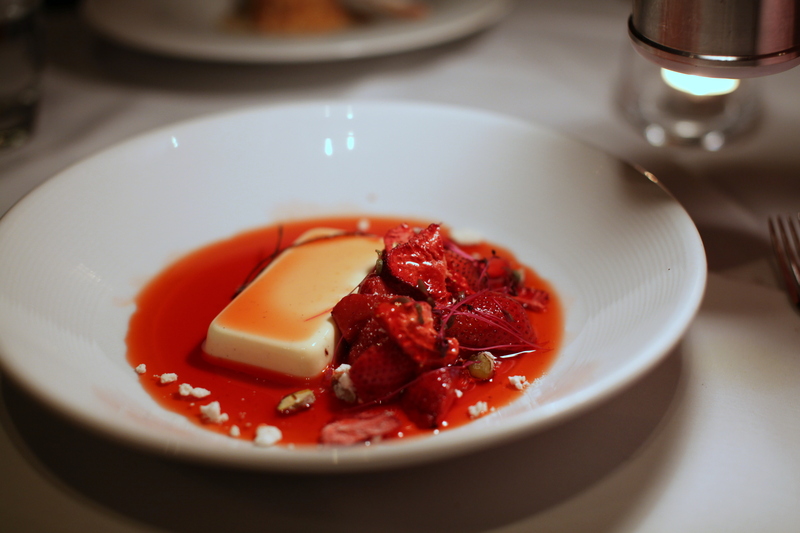 There was an airy lightness to the skillfully executed bavarese, and its vanilla hints melded with the sweet, yet slightly acidic flavours of the strawberry salad and consomme. 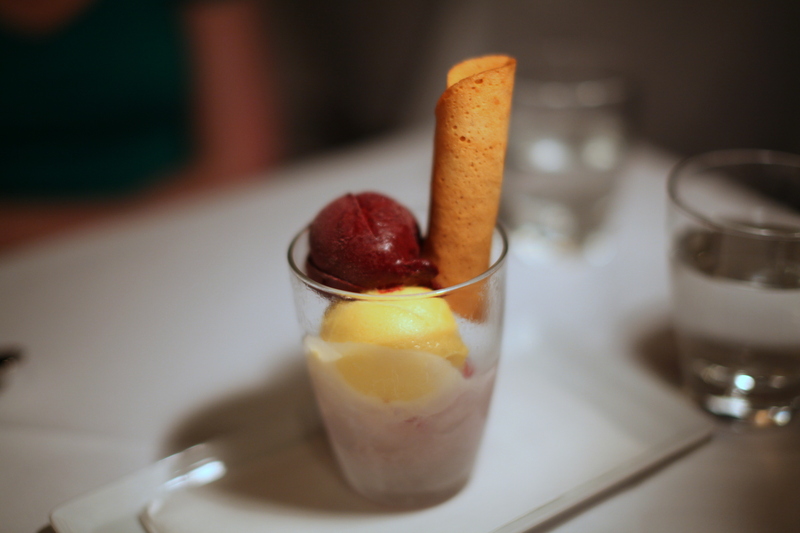 Three different scoops of raspberry, blueberry and passionfruit sorbets ($14, about £9) were all delicious, each proving fruity and citrusy. 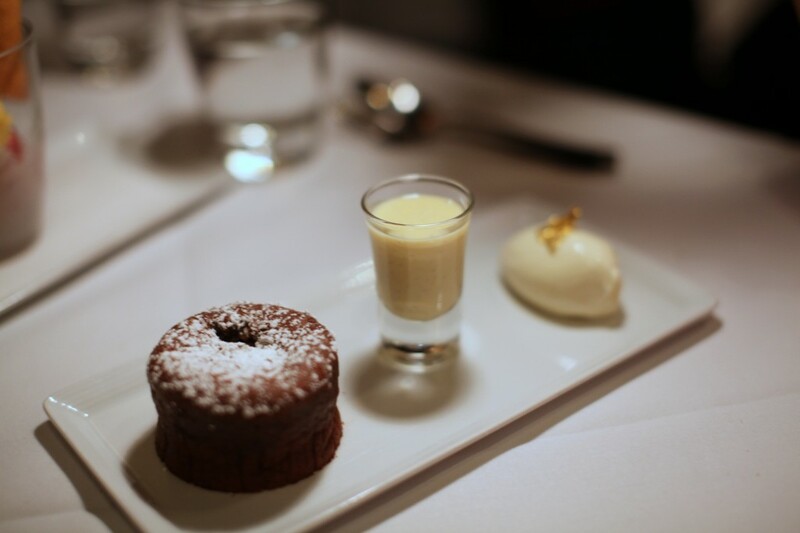 Finally a warm chocolate hazelnut pudding ($17.50, about £11.30) with a runny molten centre was one to warm your heart. I loved the nutty flavour of the hazelnut running through the rich darkness of the smooth, smooth chocolate. This was a fabulous dessert. Fondant chocolate desserts of this type are often seen on menus, but they don’t always come close to this level of quality. The cooking was truly excellent but was marred by some heavy-handed seasoning. This is a true shame because when food is this good, such poor judgment is a huge letdown. That said, it was impossible to escape the quality of the produce and the highly charged skill of the cooking at Pendolino. And so delectable were the desserts, they were enough to make me swoon. However, the service wasn’t quite as polished as one would expect of a restaurant serving food of this level. The pouring of our wine was sloppy, and we couldn’t always find a waiter when we wanted one. You can’t always have it all, but Pendolino is still worth a visit. $71 to $87 (about £46 to £56) for three courses. Excludes drinks and service.